alaTest has collected and analyzed 230 reviews of Samsung HMX-H200. The average rating for this product is 3.8/5, compared to an average rating of 4.0/5 for other Camcorders for all reviews. Reviews about the zoom and portability are on the whole positive. The image quality and price also get good feedback, but some have doubts about the viewfinder and reliability. We analyzed user and expert ratings, product age and more factors. 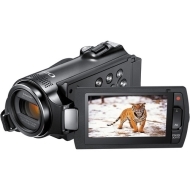 Compared to other Camcorders the Samsung HMX-H200 is awarded an overall alaScore™ of 86/100 = Very good quality. alaTest has collected and analyzed 19 user reviews of Samsung HMX-H200 from Amazon.co.uk. The average user rating for this product is 3.6/5, compared to an average user rating of 4.0/5 for other Camcorders on Amazon.co.uk. Reviewers are impressed by the portability and battery. The size and price also get good feedback. alaTest has collected and analyzed 23 user reviews of Samsung HMX-H200 from Amazon.com. The average user rating for this product is 3.8/5, compared to an average user rating of 3.9/5 for other Camcorders on Amazon.com. Opinions about the image quality and zoom are generally positive. The price and portability are also mentioned favorably. Reviews are divided on the color. Some have doubts about the reliability. I was amazed at the picture quality and features for such a small package and price but the camera stays on black screen most of the time now when i start it so its not useable anymore after about 2 hrs. total useage. The best way to relive special moments is by watching them in amazing high definition on your HDTV. The best way to do this is with the Samsung HMX-H200 camcorder. Record in Full HD (1920 x 1080 resolution) and get breathtaking images in brilliant color. It also includes 20x optical zoom so you can get close to the action and optical image stabilizer for blur-free video. Optical Sensor Size:1/4.1 / 1/4.1"